Stupendous college career with an impressive trophy shelf: Pac-12 Freshman Offensive Player of the Year (2014), Second Team All-American (2015), All-PAC-12 Second Team and Team MVP (2017). Concluded campus tenure, as the Duck’s all-time leader—and seventh in FBS history—with 5,621 rushing yards. Produced three 1,000-yard campaigns and eclipsed 100 yards rushing in 31 contests. As a freshman, helped lead the Ducks to the National Championship Game with over 1,300 yards rushing and 18 touchdowns. As a sophomore, rushed for a school-record 1,836 yards and scored 19 times. As a senior, recorded third 1,000-yard crusade with 1,475 and 16 touchdowns. At 5-foot-11 and 229 pounds, a big runner with prodigious balance and strength combined with fantastic footwork. With vision and patience, makes subtle cuts and accelerates without losing stride. Breakaway threat in the open field. An excellent zone-runner who makes one cut and explodes up field. Very good goal line and short-yardage runner. Proven receiver with good hands. Solid pass blocker who picks up blitzers. Played for three head coaches and four offensive coordinators. Not an elite athlete or speed merchant. At times, powers through defenders and finishes runs with authority. Occasionally, makes tacklers whiff in the hole. Does not jump off film study in any area. A heavy workload might scare off some personnel departments. An intelligent competitor who coaches will covet on roster. Could exceed expectations if plays in a zone scheme like coach Kyle Shanahan’s in San Francisco. Bypassed senior season to enter the Draft. 2017 SEC Offensive Player of the Year and All-American Second Team after rushing for 1,391 yards, scoring 20 touchdowns and totaling 1,585 yards from scrimmage. Catapulted onto national stage in victories over Georgia and Alabama with 167 and 104 yards on the ground respectfully. Finished Tigers career eleventh in rushing with 2,494 yards. Averaged over 25 yards on 26 kick returns. At 5-foot-11 and 213 pounds, magnificent mixture of agility, vision and explosiveness. A patient playmaker with quick burst and good lateral movement. Decisive downhill runner who promptly reaches top speed. Shakes tacklers with ease. Lowers pads at point of contact and powers through opponents. Outruns defenders at second level. At times, mirrors moves that only Le’Veon Bell employs: Takes a slight step/skip backwards and bounces runs. Near the goal line, often took direct snap in Wildcat formation. Upright runner with elongated frame and thin hips. A high-character competitor with laudable leadership skills. Must move feet more in pass protection. Did not run many routes out of the backfield but is an above average pass catcher. Suffered shoulder injury during the season, which will be examined at the Combine. Very high ceiling as a professional if he avoids big hits and stays healthy. An under-utilized asset at Tennessee. Depth chart listed Jalen Hurd and Akvin Kamara at the top for two seasons. 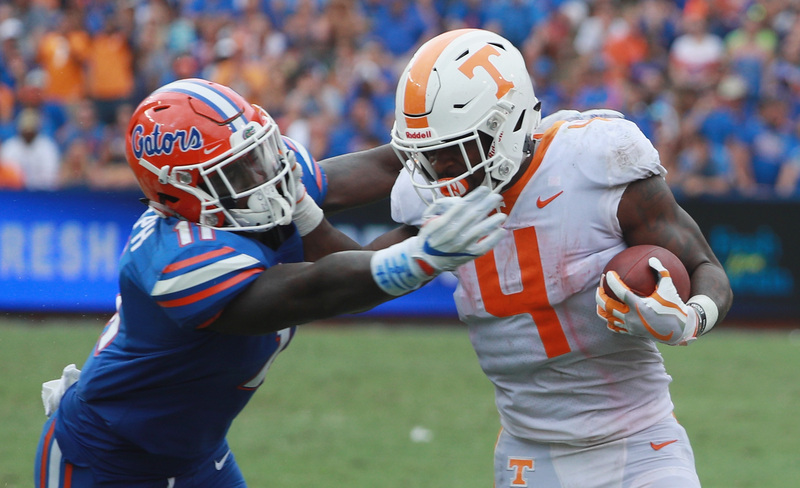 Only earned 138 carries first two campaigns in a Vols uniform and rushed for 795 yards. Last year, became the main back and led the team in carries with 189, rushing for 778 yards and scoring nine touchdowns. Also, caught 37 passes for 299 yards. At 5-foot-10 and 216 pounds, explosive playmaker who runs with a chip on shoulder. Combination of power, agility and burst provide a difficult challenge for defenders. Impressive flexibility. Maximizes effort, never stops churning legs and gains the utmost yardage possible. A downhill competitor who runs with anger and purpose: Uses stiff arm to impose will on tacklers. Lowers pads to gain leverage. Notable hop steps to avoid traffic and jumps to the edge of the defense. Played behind a poor offensive line and gained positive yards despite being hit in the backfield at times. Solid hands as a pass catcher and turns up field quickly after making the catch. Does not possess an elite athletic trait and lacks top-end speed. Off-the-field character concerns—arrested for Marijuana possession and suspended afterwards for Kentucky game—might turn off some teams. A versatile runner who will help a team in many areas and could become a starter if drafted into the right situation with a creative offensive coordinator. A rising prospect after Senior Bowl week roused the scouting community. During the practice sessions in Athens, GA, timed at 19.42 MPH maximum speed, which was the second best among runners. 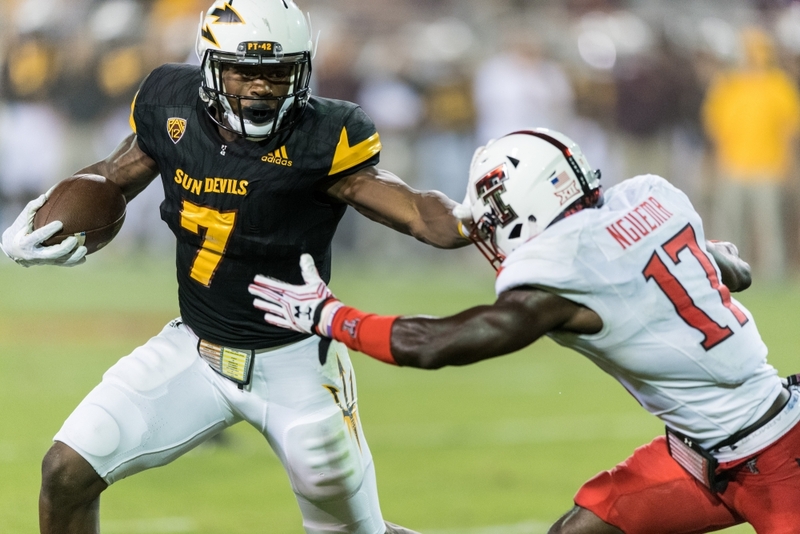 Rotational runner at Arizona State: Played behind Demario Richard. Gained only 1,984 career rushing yards and scored 29 times in four seasons. Never exceeded 1,000 yards in any campaign. Over the past two crusades, grabbed 64 receptions for 560 yards and a touchdown. At 6-foot-1 and 228 pounds, a big and fluid athlete with a sold combination of speed and power. Good lateral movement and quick feet. Patient behind the line of scrimmage, great burst through the hole and rapid in-and-out of cuts. Excels on inside zone plays between the hash marks. Absorbs hits, drives feet and falls forward upon contact. Uses jump cuts, stiff arms, spin moves and shoulder fakes to avoid defenders. Smooth receiving skills and great hands. Solid pass catcher with long arms and a large catch radius. Turns up field swiftly after the catch. Below average outside ball carrier. Inconsistant runner who dances in the hole too often. Upon contact, loses balance and does not always generate power that physical traits indicate. Projects best as a grinder in a two-back system as a professional. Rated as a four-star recruit and the eleventh best runner in the country coming out of Booker T. Washington high school. As a freshman, played in all 13 games and rushed for 450 yards and nine touchdowns, leading the team. Sensational sophomore campaign with over 1,100 yards and 14 touchdowns. As a junior, suffered a season-ending right ankle injury at Florida State: On only 56 carries, totaled 428 rushing yards and reached the end zone three times. At 5-foot-9 and 202 pounds, short and solid with dense lower body. Packs a punch when lowering head and pads into defenders. Continues to fight after first contact. Combines patience with excellent vison to identify the running lane. Employs spin moves and stiff arms opponents to avoid being tackled. Accelerates to the corner rapidly. In space, good lateral agility and movement. Nice pass catcher with soft hands. A fluid and versatile athlete in the mold of the Patriots James White. Lacks elite speed and dances in the hole too often. Does not always executes the run play as called and looks to hit a homer. Is he the next prodigious Miami ball carrier (Edgerrin James, Clinton Portis, Frank Gore and Willis McGahee) in the NFL? A bruising sledge hammer between the tackles. Recorded best season as a sophomore with 812 rushing yards and 11 touchdowns. Finished the campaign with huge performances in post-season (SEC Championship, CFP Semifinal and CFP National Championship): 46 carries for 364 yards and six touchdowns, averaging 7.9 yards per carry. Earned Offensive MVP in CFP Semifinal against Washington. At 6-foot-1 and 232 pounds, an imposing athlete with a punishing running style. Easily shrinks in traffic and finishes runs with punishment. Confronts tacklers and delivers blows. Predominately lined up in I-formation and perilous with a head of steam. When lane opens, resembles a runaway tractor-trailer truck. Surprisingly good outside zone runner: Makes one cut and powers ahead. Productive short-yardage and goal line runner. Falls forward upon contact. Punches blitzers in pass protection. Among runners at Combine, finished first with a 10’9” broad jump and second with a 40” vertical jump. Less than 300 career carries. An old-school power back, who explodes into daylight when a lane opens. In 2017, 1,430 rushing yards on 206 carries and nine touchdowns. Exceeded 100 yards rushing in six games and paced nation with eight touchdowns over 50 yards. Accrued 3,198 career-rushing yards on 480 carries and 22 career touchdowns. A classic North-South runner with breakaway speed at 6-foot-1 and 213 pounds. Unique blend of quickness and strength: Runs away from opponents, and at times, over others. Does not go down after initial contact. Breaks tackles and fights for extra yardage. Occasionally, employs a nasty stiff arm. Good hands catcher. Played behind two of the best offensive lines in the nation: OG Quenton Nelson and OT Mike McGlinchey. Stymied by the Miami Hurricanes athletic and fast defense. Not a quick-twitch athlete: Lacks lateral quickness and agility. Upright running style: Needs to keep pads lower. Does not accelerate as rapidly as elite NFL runners. Is not a dynamic pass catcher. If employed in a power-run scheme, could become a valuable asset in a two-back rotation.